Caterpillar® final drive and transmission parts work together to transmit power to the ground and Caterpillar designs and manufactures its transmission and final drive components with these demands in mind, using testing processes that simulate real world applications. The result is a final drive train system that lasts longer and works harder over the life of your machine. 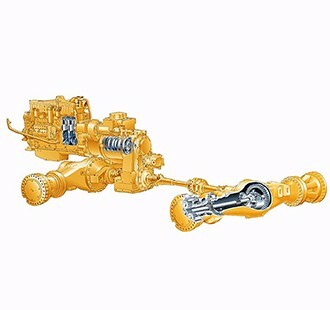 Caterpillar Drive Train Parts are designed, manufactured, and tested to deliver reliable and long life. Gear and Pinions – Special heat treatment ensures proper surface and core hardness to resist impact loading, case crushing, tooth breakage, and pitting. Shaved gear tooth surface prevents excessive contract stresses on mating teeth and reduces pitting. Anti-Friction Bearings – Special features for improved lubrication and load distribution. Smoother surface finish on races and rollers leads to lower rolling resistance and friction. Rounder roller crown distributes loads across rollers to prevent gear misalignment.•Duo Cone Seals – Unique design for contamination resistance. High-alloy steel rings provide corrosion and abrasion resistance. Precision-lapped surface seals in lubricates and keeps out contamination. Planet Shafts – Specially crafted for maximum bearing life. Precise tolerances resist premature bearing failure. Special surface finish allows maximum needle bearing life and performance with minimal rolling resistence. Carriers – Precise design for efficient power flow and less wear. Precise shaft hole locations provide correct mesh and load distribution between gears. Brake Discs / Plates – Superior construction for wear resistance and long life. Porous fiber face on each side of disc ensures discs and plates to minimise wear. Uniform ridge patterns on discs promote oil flow to keep brakes from reaching excessively high temperatures. Brake Linings – Quality materials for improved strength and reduced wear. Heat-resistent materials maintain strength under high operating temperatures. Specially designed linings absorb wear to reduce the need for disc replacement. Exacting design for proper measurements and hardness. Heat-resistent materials maintain stength under high operating temperatures. Specially heat treatment achieves proper surface hardness, core hardness, and hardened depth. For more details contact your Parts & Service Sales Representative today.